All press is good press, right? 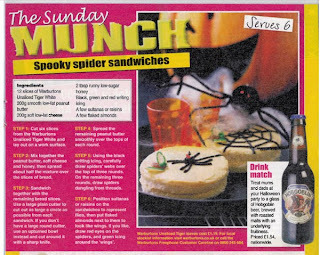 I found this rare example of a main stream food and beer pairing article (of sorts) in the Sunday Star Take 5 Magazine. Part advert, part recipe, part beer plug and part mental. Words fail me; I feel like I need to go and write two good pieces on food and beer to try and restore balance to the universe. It's PR plain and simple. You may only make those cakes on Warburtons bread. Nothing else will do. And don't you dare think about using anything other than Hobgoblin to wash it down. What are these weird products? Low-fat peanut butter? Low-sugar honey? Do these things even exist?